Also, how many food halls can we sustain? The Dayton's Project has a 40,000 sq.ft. 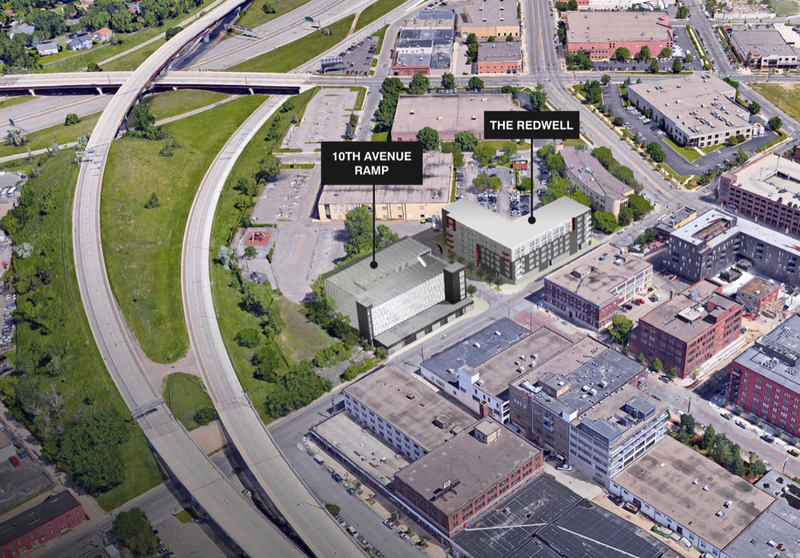 food hall planned, there are two under way in St. Paul, one in Northeast, and obviously Midtown Global. But it would seem to complement the plethora of nearby breweries quite well. They actually can't. The condo building next door owns the air rights to protect their views, so they can't build taller than 40'. It's unfortunate, but there's not really any way around it short of convincing the condo board to sell the air rights back. Is this the first condo association/homeowner that "gets it"!? If you want the view, you have to own the view. I don't think it is unfortunate at all. The original developer owned the entire block and the Bookman stacks was masterplanned to have a tall condo building with a low rise and a green space between. This provides texture and varying degrees of scale to the block. The developer could have done a 3 or 4 story donut-shaped or U-shaped building that filled the block but opted for this route. This is an example of actually taking a wholistic approach. It seems a bit odd now because the neighborhood is very different than it was when this was completed but it is still a good approach. The only downside is that it is taking forever to build the low rise. The original developer was going to do a swanky restaurant on the space but that fell through in the recession and so it still sits undeveloped. I think this is a great concept and assuming the "food hall" approach allows for a few cheaper options it would be great for the neighborhood. We don't need another $15 burger. They literally can't, the Bookmen Stacks owns the air rights on this plot, so this is as high as the developer can go. The views from the Bookmen Stacks are great, it's a well-planned block that's taking awhile to get completed. The property is governed by the Stacks condo board I think- so no view blocking buildings I'd guess. The Bookman parking is under the site. I've got a interesting tidbit on this one -- when I was touring a unit at The Stacks in 06' I was told they had air rights to the plot in front of them and therefor the views would be retained. It was all kind of hush-hush backroom deal sounding, so you didn't hear it from me. Owning the air rights and owning the land are two different things. Anyone have the info on this one? I can't access the article, but I would guess that it's about the Schafer Richardson apartment project along 3rd St N (http://www.journalmpls.com/news/develop ... orth-loop/) - that large parking lot has been the rumored location for the NL park. Last I heard, the park would be about 0.75 acre. The park aside, am I the only one that thinks it's a joke that this neighborhood can't seem to get anything better than a generic, fairly ugly six story apartment building? Wasn't there some legislative changes made last year that were supposed to make things easier/more viable for condo developments? With the dwindling number of available lots, it seems like the neighborhood is close to realizing its potential, or at least its easy to envision what that potential looks like, and it's fairly disappointing. What are you looking for? Height? Aren't there height restrictions? I actually like most of the newer stuff, mostly because it looks modern and easily distinguishable from the old stuff, much of which is cool. I'll grant you the older generation of new stuff (e.g., River Station condos & TownePlace Suites) are pretty boring. The closer North Loop development gets to Plymouth Ave, the more I dwell on the crappy urban experience of the 94 viaduct. There are a lot of opportunities to reconnect some of the grid up there. It is strange to me that they're building 20+ story towers across the river, but nothing more than 5+1s in the North Loop. There's height restrictions, of course, but the limit is 140', so they wouldn't prevent an 11-story building like Latitude 45 or Iron Clad.